Faith vs Religion: Ecclesiolatry, Scribes and Pharisees. There is an important distinction between “faith”, which refers to belief and a relationship with the divine, and “religion”, which refers primarily to the human structures which support it, with their rules, rituals, and clerical castes. They are obviously linked, interdependent, and ideally, support each other. There are grave dangers though, when we lose sight of the importance of balance, for example by exaggerating the importance of religious structures, over authentic faith itself. In recent weeks, I have found two important passages on this theme, by two very different authors, that I have wanted to write about – but have struggled to make the time to add my own response. Instead, I simply share with you the passages, and leave you to ponder the import yourselves. You will probably have heard many different ways of talking about what “the Church” is, many of them quite frightening (in just the same way that many ways of talking about the Bible are frightening). You get the impression that you are hearing a discourse about power, or a discourse emerging from ownership of “position”, or a justification and defense of traditional and historical prerogatives. It is not necessarily the clerical caste in the Church who talk in these ways, though we are particularly susceptible to it. Often enough lay people, politicians and others, will also wield “The Church” as a weapon in cultural wars in much the same way as others wield “The Bible”. Indeed typically, while the default Protestant error is “Bibliolatry” – making an idol of the Bible, – the default Catholic error is “Ecclesiolatry” – making an idol of the Church. The idol worship to which each of our groups is prone is slightly culturally different, even if the underlying pattern is the same. When we worship an idol, our love, which is in principle a good thing, is trapped into grasping onto something made in our own image. This “something”, which we of course do not perceive as an idol, then becomes the repository for all the security and certainty which we idolaters need in order to survive in the world. We are unaware that the tighter we grasp it, the more insecure and uncertain we in fact become, and the more we empty the object which we idolize of any potential for truth and meaning. And of course because love is in principle a good thing, for us to get untangled from its distorted form is very painful. Nevertheless, against any tendency we might have to blame the idol for being an idol, it is really the pattern of desire in us, the grasping, that is the problem, not the object. For just as the Bible is not an act of communication that we can lay hold of, but the written monuments to an act of communication that takes hold of us, so the Church is not an object that we can grasp, but a sign of our being grasped and held; not something that any of us owns, but the first hints, difficult to perceive, of Another’s ownership of us. As the word suggests, the Scribes were the temple bureaucrats and the lawyers who could read and write and who, therefore, kept the records and managed the business of the Temple. The Pharisees were members of a lay reform movement in Judaism that called for a return to the old ways–to the “fundamentals”–insisting on literal interpretation of the Torah. They believed in angels and supernatural interventions and were always preaching that the end of the world was imminent. 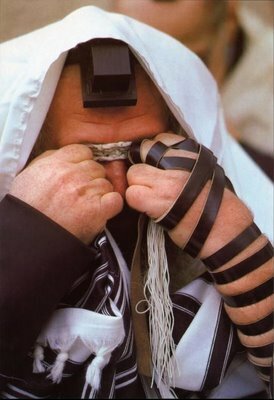 All Jewish men dressed for prayer by strapping phylacteries (little wooden boxes containing the written text of the prayer Shema Israel) to their forehead and left arm in literal obedience to the text which said to keep these words as a sign for the hand and a pendant on the forehead, and by covering their heads with a prayer shawl with fringes, knotted to signify the 613 rules of the Mishnah (the oral tradition extrapolated out of the Ten Commandments). The Pharisees were ostentatiously religious: they wore elaborate phylacteries with broad straps and oversized shawls with extra long fringe to demonstrate how obedient they were to the letter of the law. The Pharisees were clearly the predecessors of our modern day conservative evangelists and TV preachers who bemoan the present state of the world, predict that according to Bible prophecies the end of the world is nigh, and proclaim how saved they are. This entry was posted in 01 General and tagged Catholic, church, James Alison, Pharisee, Toby Johnson by Terence. Bookmark the permalink.